Poetry Friday round-up is at Buffy’s Blog. Summer is here! I’ve been enjoying long mornings to walk and swim, pick blueberries, just lingering, not rushing. I remember a Ditty Challenge a while back from Nikki Grimes about writing a wordplay poem. The word linger keeps coming up for me. I paired a wordplay poem with an image I took at the lake in Mississippi where my parents live. A lake is a perfect place to linger. Wonderful to personify ‘linger’, a word that holds much to love, Margaret. Your parents’ lake is a gorgeous thing to live by! Lovely–the poem, the picture, and the idea of lingering. Enjoy your summer, Margaret! What a stunning poem and photograph to pair with it. I’m so glad you have summer to linger in. I’m close but not there yet. I love how the last line of each stanza makes its own poem. I want all the details of ALA! I loved that challenge, and glad to see you revisit it with this perfect summer poem! Love how that last line captures the essence of linger. Llngering here” puts one right in the moment, savoring what’s present. Linger might have to be a OLW for me sometime in the future. So glad you’re enjoying slow days. I first read this delicious poem on FB… or maybe it was Twitter. Anyway, I immediately recognized its roots in Nikki Grimes’ DMC challenge. Some of these challenges having serious lingering power and this is one of them! You did a beautiful job capturing “linger”‘s essence, Margaret. Thanks for the opportunity to spend some time with it. 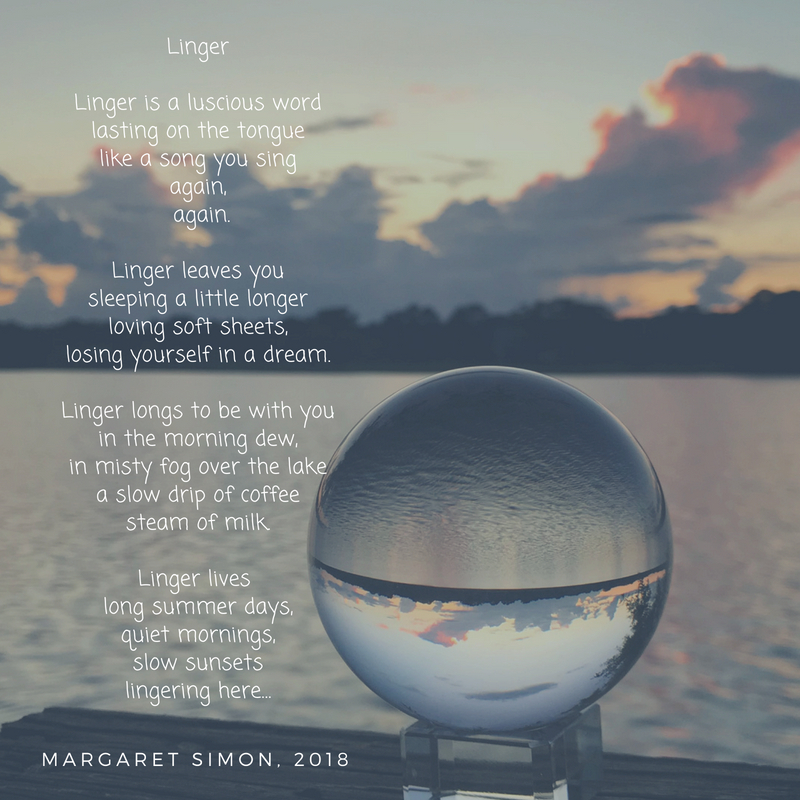 What I like best about your “Linger” poem is the satisfying calm it leaves you with, thanks Margaret, it’s lovely! Beautiful imagery too! Ahhhhhhhh. Thank you for a perfect summer poem, Margaret – wishing you many more beautiful lingering days season! This is wonderful, Margaret. I love that first stanza especially and all those lovely “l” sounds and the idea of long, lingering, lazy days. Not yet, but relatively soon! Enjoy! Beautiful! Thank you for the invitation to linger through these days. I needed the reminder after this past busy week.